This post contains affiliate links because a playa has got to get paid! If there's one thing I've learned about marketing over the years, it's that technology can be your best friend in growing your business. So it's critical to get the best technology that's right for you. If I've learned anything else, it's that you need to keep an open mind and be willing to test various software and tools to figure out which one can deliver the best results. Is it a headache? Sometimes. But is it worth it? Absolutely, since the results pay for themselves. That's why I've tested multiple email services over the years. I actually used several different opt-in forms that went to different lists. I've tried MailChimp, MadMimi, ConvertKit, and finally Drip. When I first started working with ConvertKit, I thought it was great. Then I started using Drip and found out that it was so much better. If you want to give it a try, Drip offers a 21-day free trial and is completely free for up to 100 email subscribers. ConvertKit offers absolutely no free trial. I know there are a lot of online "reviews" where people talk about products and software they don't even use just to get an affiliate commission. So, I decided to upload a screenshot of my actual account in Drip to prove to you that I actually use it. What was that thing that I learned again? Oh yeah - testing! This was a big deal-breaker for me. At the time of this writing, ConvertKit does not offer the ability to perform A/B tests, while Drip does. What do I mean by this? I mean continually testing your subject lines and email copy to see which gets the best results. I have personally taken my open rates from 20% or so to consistently over 30-35% because of split testing. That means I have gotten a 50% increase in revenue from this single feature alone. Wouldn't it be nice to know if your prospects consistently prefer one type of email over the other? Wouldn't it be nice to split test and take your email funnel from giving you five appointments a month to ten? Or fifteen? Drip has this amazing feature that will literally score your leads for you, on autopilot. You could log into Drip, take a look at your leads and see who is "hot" and who is "cold". That way you could send more sales-related material to your hottest leads. How exactly does this work? Well, you set it up however you want it, but the basic idea is that if someone is opening and clicking on your emails, that person is more engaged than someone who isn't. With Drip, you can assign point values to different actions to score you leads. For example, you could have Drip automatically assign one point to a lead every time he or she opens your email. If the person clicks on your link, you could assign them three points. If he or she attended a webinar (a more engaged event), you could assign a larger number of points. From there, you can see who has the most points in your email list. If 10% of your list has a super high number of points, it means that they have been opening, reading, clicking, and engaging with most of the stuff you've put out. You see going to speak to those people differently than someone who hasn't engaged with you at all. While both Drip and ConvertKit offer segmentation, Drip is more in-depth and better able to deliver results. This advanced segmentation has allowed me to grow my business like nothing else. For example, knowing which email subscribers haven't opened my emails allows me to segment them and send them an intriguing email to hopefully get them re-engaged with me. After all, I'm paying for them to be on my list, so I want them to do stuff. I love this feature so much because it allows me to construct more personalized emails for my list. If someone has viewed cold calling articles and clicked on my cold calling links, guess what I'm going to send? More cold calling stuff! With my financial advisor clients, I teach them how to segment their website and list to achieve similar results. If you can tell that someone has interacted with all of your tax saving strategies but none of your retirement planning stuff, you can eventually ask for an appointment to discuss tax saving strategies. If you have no data about your prospects and ask for an appointment to discuss retirement planning, you'll fail. Being able to tailor your approach like this will make you more money. Period. Another one of my favorite Drip features is the ability to resend broadcast emails. For those of you who might not know, while you may have different email campaigns that run on autopilot, a broadcast email is one that you make and send out “manually”. But let’s say that you send out a really important broadcast email that you definitely want people to see. In Drip, you can resend to people who didn’t open your previous broadcast. For example, I can send an email out today to my email list Then, I can schedule an email for a few days from now to send ONLY to the people who didn’t open the previous email. When you do this, you want to wait a few days (I’ve found at least three days for the best results) before sending out your second email. If someone hasn’t opened your original email by the fourth day, he/she will likely never see it. What I do is change the subject line and resend it. That way the email subscriber will see that I am still staying in touch and treat it as a completely new email. My open rate on the first email might be 30%, but sending out this second email (completely on autopilot, by the way) gets me another 10-15% open rate. They write an email and send it out to their list, asking for an appointment as a call to action. Drip allows them to check a box to resend to any unopens. They enter in a unique subject line and schedule the second delivery. They reap the benefits of having more people see their email (without getting annoyed). "Great! Time to check these emails that I love getting..."
This is where Drip really shines – it’s their unique value proposition, if you will. Not only does the Drip software allow you to automate your entire marketing process, but it allows you to create a visual workflow showing you exactly what happens throughout your marketing funnel. My biggest mistake so far with using Drip is not taking advantage of the workflows. It would’ve made my life so much easier. Instead, I just created a bunch of rules and pieced them together in my head. My work would’ve been much smoother and faster if I had everything laid out in front of me. A lot of people get turned off when I tell them this, but sometimes you WANT people to unsubscribe. You are paying for people to be on your email list, and if someone isn’t engaging with you or doing anything, do you really want to pay for that person to take up space? No. That’s why I love Drip’s ability to prune lists. You can go to your subscribers and filter them down to people who haven’t opened a certain amount of your emails. For example, I could filter out anyone who hasn’t opened my last ten emails and then delete them from my list. Plus, a lot of people don’t realize that your overall email metrics can affect your deliverability. Basically that means that the “dead weight” (people who aren’t opening or clicking anything) is affecting your deliverability to the people who actually want to receive stuff from you. Don’t let the dead weight hold you back from doing business with people who genuinely want to work with you. Finally, cleaning up your list makes it easier to tell what’s working and what’s not in your email marketing. If you send an email out to 1,000 people but 500 of them have stopped engaging with you, it’s easy to get discouraged. But let’s say you prune out that 500. All of the sudden, 20 people clicking on your email goes from a 2% clickthrough rate to 4%. This helps you better visualize large percentage swings in your metrics so you can adjust your strategies and react to what’s working. 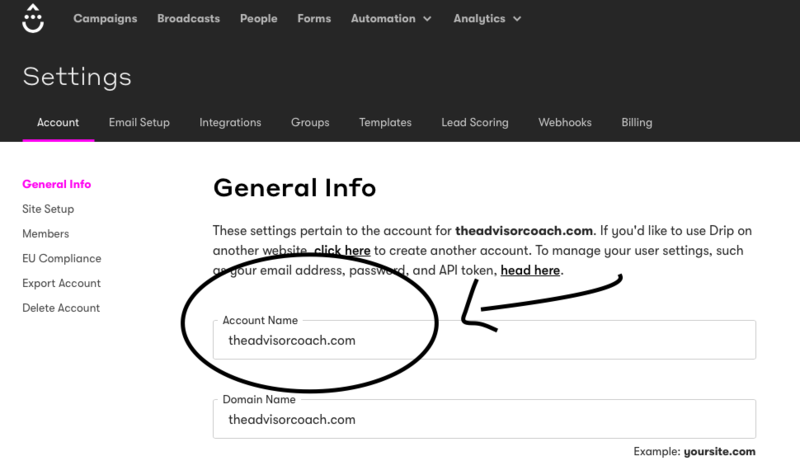 A lot of my financial services professionals switch over to Drip when they hear that Drip provides email templates to help you write your emails. So if you want to use ConvertKit, you'll either have to write the emails yourself or hire a copywriter to help you. Drip. It's not even close. Drip has a wealth of webinars that you can watch to get up to speed. I personally love watching the webinars because I can take notes and reference them later. But both places offer great customer support. I've had to use Drip a little bit more (simply because I've had them longer now) and I've always gotten a quick and detailed response. For example, one day I was having some serious brain-fog and forgot where to find my account ID. I reached out to Drip and they solved the problem in less than four minutes. I've attached a transcript of my customer support chat below to prove it. 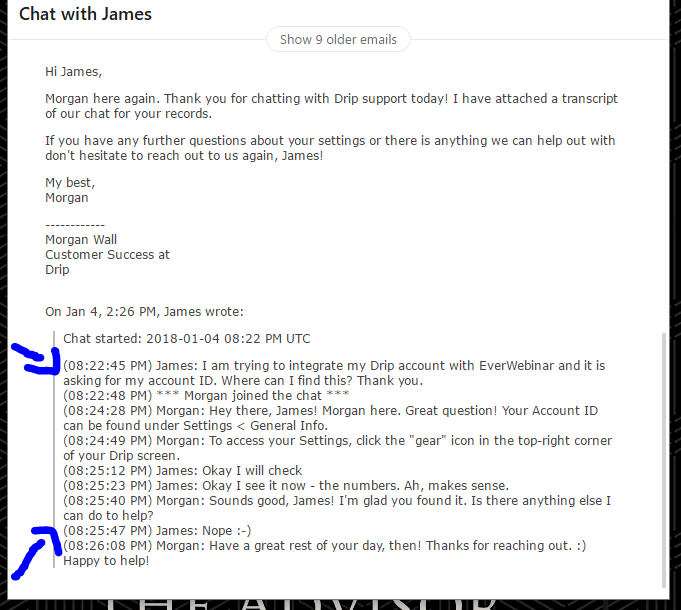 An example of Drip's amazing customer service, where they fixed my issue in less than four minutes. For everything that it does, Drip is actually a great deal. If you want to stick with a $10 per month email software, go right ahead, but the ability to score your leads, automate everything, resend broadcast emails, etc. will almost always make your money back and more. Drip currently offers a 21-day free trial, and you can sign up for your free trial right here. ConvertKit doesn't offer a free trial at all. When you sign up for a free trial of Drip, you’ll get a fully functional account for 3 weeks, which gives you access to everything that Drip has. And don’t worry about forgetting to cancel the account if you hate it – Drip will even send you an email a few days before your trial ends to remind you. I thought that was really nice of them, especially since so many companies bank on you forgetting about your trial, just so they can charge you. But remember that Drip is free for up to 100 subscribers. So even if you have more than 100 subscribers right now, all you have to do is take 99, move them over to Drip, and give it a try. You won’t regret it. ConvertKit might be a good email marketing automation  software, but if you're someone who needs to nurture leads into prospects and eventually clients, you need Drip. P.S. If you think that you can just wait to Aweber or Mailchimp to catch up, don't. Drip is constantly leading the way with their features and integrations.